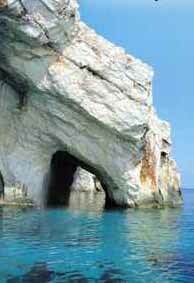 Zakynthos, Zante, Ionian Islands, Greece Inclusive Holidays. Is the sixth of the Ionian islands, west of the Coast of Ilias. Despite being shaken by earthquakes Zakynthos is still the "Flower of the Levant" (Fiore di Levante) praised by the Venetians for its gentle climate, its luxuriant flora, its fertile soil and the charm of its inhabitants. The island, which is 403km2 - 156sq miles in extent, rises in the west in a chain of limestone peaks reaching 756m 2 480ft and levels out to the east in a fertile plain producing olives, citrus fruits and good white wines (Delizia, Verdea). The tar deposits in the south near Keri were used in antiquity for caulking ships. Beaches of fine sand, particularly at Laganas (hotels, taverns) and Argassi.Measures are being introduced to protect the turtles which have chosen the beaches around Laganas Bay as breeding ground. 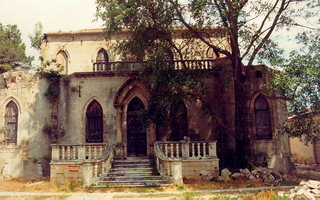 Cultural centre: From 1489 to 1797 Zakynthos belonged to Venice which maintained an oligarchy of nobles inscribed in a Golden Book; this was a period of intense activity. When Crete fell to the Turks in 1669 many artists moved to Zakynthos and contributed to the lonian School of painting which combines the Byzantine tradition and the Venetian Renaissance. In the late 18C and early 19C Zakynthos became a breeding ground for poets, whose work was a blend of the Hellenic and Italian cultures: Ugo Foscolo (1778-1827), a master of romantic Italian literature, who campaigned for the independence of Italy and died in England. Dionysos Solomos (1798-1857), educated in Cremona, who became the poet of Greek independence and was the author of the Greek National Anthem - "The Hymn to Liberty" - translated into English by Rudyard Kipling. Andreas Kalvos (1792-1867), who travelled to Zurich and London with Foscolo and also supported the Greek struggle for independence in his poetry. Nowadays, the poets have been succeeded by popular singers who perform the famous local barcarolles (minores). Beaches: Wonderful beaches in the gulf of Keri, Lagana, Porto Roma, Argassi, Alikana, Alikes, Banana, Mavratzi, Kalamaki, Tsilivi and in Vasiliko. Night Life: Restaurants, taverns and discos can be found in the city and in many other places. Transportation: By plane from Athens to Zakinthos there are flights every day. For more information contact Olympic Airways in Athens tel. (210) 961.6161 and Olympic Airways in Zakinthos tel. (26950) 028.611. By boat from Killini to Zakinthos there are many ferries every day (duration:1,15'). For more information contact the Coastguard of Killini tel. (26230) 92.211. For information on how to get to Zakinthos by bus, contact KTEL in Athens tel. (210) 512.9432. Holidays in Greece, Hotels & Tourism in Greece.